We have created a soothing oasis right in the middle of Iowa. We cater to those who are seeking an escape from the outside world into serenity and peaceful relaxation. 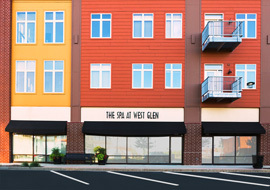 The Spa was designed by LDL Studio in Providence, Rhode Island. As you will see, every detail of architecture and interior design is used to create and exceptional sensory experience. You will notice as you walk through The Spa that simple, rectilinear lines define the spaces. The design features clean, refreshing and neutral colors and textures that are naturally soothing and relaxing. Natural materials were selected with a green-focus, where ever possible. In our reception, is one of the most talked about features of The Spa, the wall. The Wall is constructed from Kirei board wall paneling. The Kirei Board is a composite panel manufactured from reclaimed sorghum straw that is gathered after harvest.